The story follows village headman Abaw Buseu on his journey from Thailand to a gathering of the Akha-Hani people in China. He is accompanied by an Akha radio presenter and the film team. Using the Internet, they transmit discussions from the gathering back to a radio station in Thailand for broadcast to remote mountain villages. Three million Akha and Hani people live across the borderlands of five nations: China, Lao PDR, Vietnam, Thailand, and Burma (Myanmar). They identify as one people (Hani-Akha) through a common ‘tribal’ history, rather than the modern world history that created the nation states they live in. Theirs is an oral culture; traditional knowledge is passed on through the generations by recitation from memory. A pioneering hybrid Internet – radio – documentary film project filmed in the late 90ies, this is also the first feature documentary produced in Akha language. If the Akha can speak then why can’t they be heard? Dissertation/BA by Jessica Goyder. Westminster University 2001. 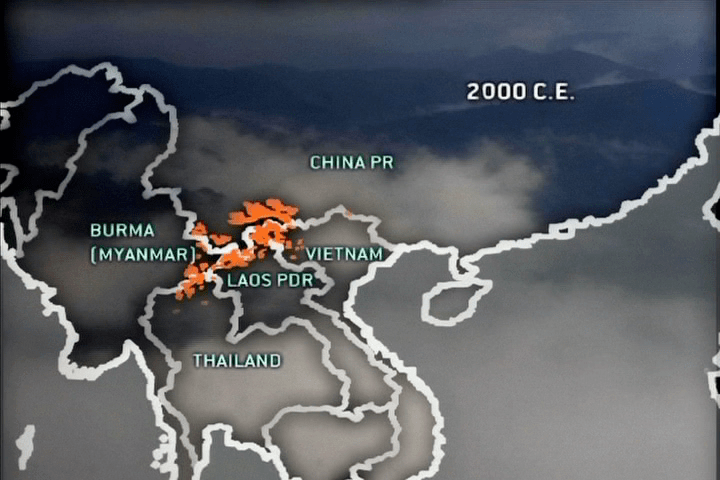 The use and impact of the media by the Akha, a tribal minority in South East Asia. Manu Luksch. Virtual Borders or Digital Divide? IN: net.congestion 2000. Our Man In London. CD album by Aju Jupoh and Mukul (in progress). 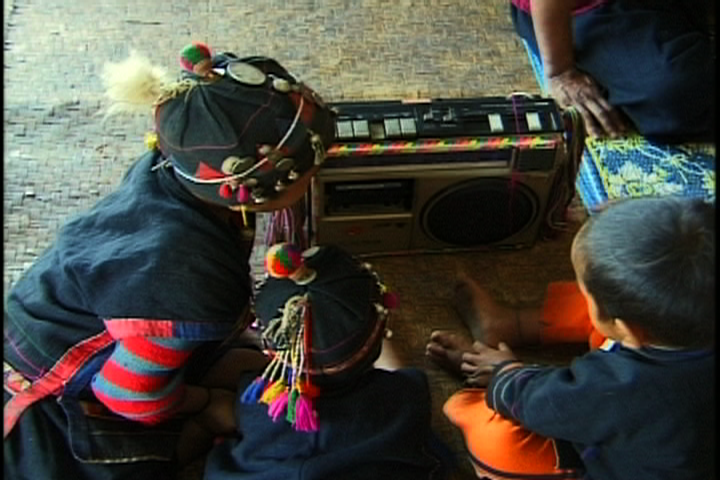 Contemporary interpretations of traditional Akha songs. As part of the VIRTUAL BORDERS project, an internet link between the TICHAC in China and the Akha Language Radio Station in Thailand was set up. Mrs. Asseu was recording interviews and reports, which were encoded to realaudio and transfered via ftp to Chiang Mai. There, Mrs. Apho downloaded them with the help of VB team member Tarik, and integrated the reports on the same day in the daily Akha language radio programme. Aq kaq dawq paw neh jangr dov taq-euq. Dawq gaq lar-eu GAR KAWV LOVQ-EHR. Iq terq nevq TICHAC hawr-eu lavq bui aq kaq, Taiq meuq-eu aq kaq dawq, bawq keuv sar dawq xawq zar-angr covq cavq-awr mr dov-euq. Aq piq Ar seuv dawq kawq lehq hmq-awr dawq cavq bivq-euq, ftp-angr neh dawq cavq xawq-awr, Aq nyir Ar poq yawq nang nav luvq Cevr mavq meuq-angr jawr-awr tiq kawv lovq-ehr bawq keuv sar dawq xawq zar-angr bi dov-eu meh. was held from December 29, 1999 to January 5, 2000 in Jinghong City of Xishuangbanna Yunnan , PDR of China. This conference was undertaken by the Peoples Government of the Xishuangbanna Dai Autonomous Prefecture, Yunnan , China. The Conference is co-organized by Mr.Cha Ke,Vice Governor of the People’s Government of Xishuangbanna Prefecture and Mr.A Hai of the Ethnic Research Institute of the Xishuangbanna Dai Autonomous Prefecture. To promote and re-enforce the splendid traditional Hani/Yaniza Culture. To promote research and investigation of Hani/Yaniza Culture. To strengthen de academic exchange between researchers of different countries. We are happy to invite and count on the presence of representatives and researchers from 14 countries to attend this meeting. They include ,besides China, Thailand, Burma, Laos and Vietnam, besides Japan, Australia , New Zealand, the United states of America, and European Countries such as England, The Netherlands, France , Germany and Sweden. During the Conference Work Groups will be set up and these groups will also have communication and investigation trips into Akha villages in the region. The Third International Conference on Hani/Akha Culture . (TICHAC) December 29,1999- January 5,2000. 1. Hani/Akha traditional eco-environment protection and sustainable development. 2. Hani/Akha traditional education and the impact of formal education on the nationality’s quality. 3. Hani/Akha history and culture (including also :genealogy, medical knowledge ,handicraft and dress, food-habits ,music and dance, funeral and other ceremonies, philosophy ). 4. Hani/Akha women and children: their empowerment and education. 5. The impact of international exchange, information and tourism on Hani/Akha economics, culture , education and development. 6. The impact of neighbouring ethnic cultures on Hani/Akha culture and its development. 7. Comparative research about Hani/Akha language/dialects, traditional oral literature/texts and literacy in the Lancang/Mekhong quadrangle subregions .